This delicous little snack couldn't be easier to make. 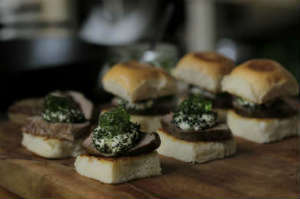 This one's a little bit flash with some aged lamb, french goat's cheese and some mint jelly. 1. Season a lamb backstrap and pan fry to your liking in a hot pan. Once cooked, remove it from the heat to rest for about five minutes. 2. Chop up some fresh herbs such as Italian parsley, basil and mint. 3. Slice a log of goat's cheese (or feta) into little 1cm wide discs, then coat in the fresh herbs. Press the herbs in so they don't fall off. Heat the cheese in the oven on some grease proof paper for about a minute to heat through. 4. 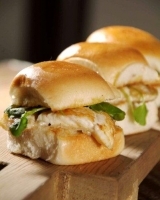 Cook your slider buns by buttering both sides and heating through on a hot pan until they're soft and golden brown. 5. 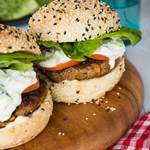 Slice the lamb and place a portion on each slider bun. Add the cheese discs followed by a dollop of your favorite mint jelly.